Where's Mjölnir when you need it? Marvelous statue of gladiator Thor as he appears in Thor: Ragnarok. A limited edition of only 1,000 pieces, it stands 17-inches tall! Pair it with the gladiator Hulk statue to form a larger battle scene! Ready to meet his "friend from work!" This marvelous sculpture of gladiator Thor as he appears in Thor: Ragnarok stands about 17-inches tall as he leaps into action with his sword raised and shield at the ready. It's a limited edition of only 1,000 pieces that comes packaged with a certificate of authenticity in a full-color, hand-numbered box. 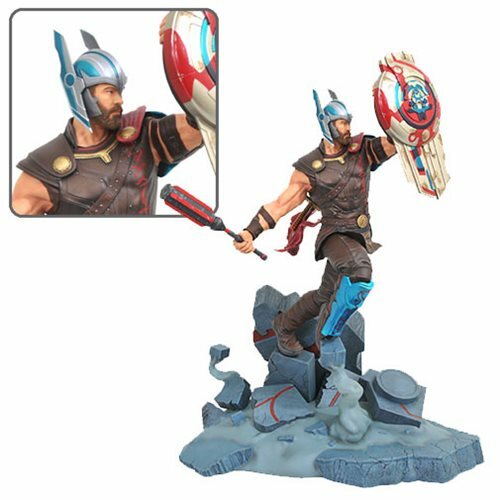 The Marvel Milestones Thor Ragnarok Gladiator Thor Statue can stand on its own, or pair it with the gladiator Hulk statue (sold separately) to form a larger battle scene!